Another year of festivities is about to descend upon the town of Goldfield. David Jacobs/Times-Bonanza & Goldfield News A look at vehicles in the Goldfield Days' car show on Aug. 6, 2016. Several antique and other vehicles will be on display at Euclid Avenue and U.S. Highway 95 (Crook Avenue) during the 2018 Goldfield Days pegged to run from Aug. 3-5. Jeffrey Meehan/Times-Bonanza & Goldfield News Beatty Cowboys make their way down U.S. Highway 95 on Aug. 5, 2017 in Goldfield for the annual Goldfield Days parade. The parade returns this year at 11 a.m. on Saturday. Jeffrey Meehan/Times-Bonanza & Goldfield News Vendors lined up along U.S. Highway 95 and side streets for the 2017 annual Goldfield Days. Vendors and others will return for the annual event starting Friday. Many locals and visitors to the Goldfield area are gearing up for the 18th annual Goldfield Days celebration. Festivities are set to begin today and last all weekend for the three-day venue. 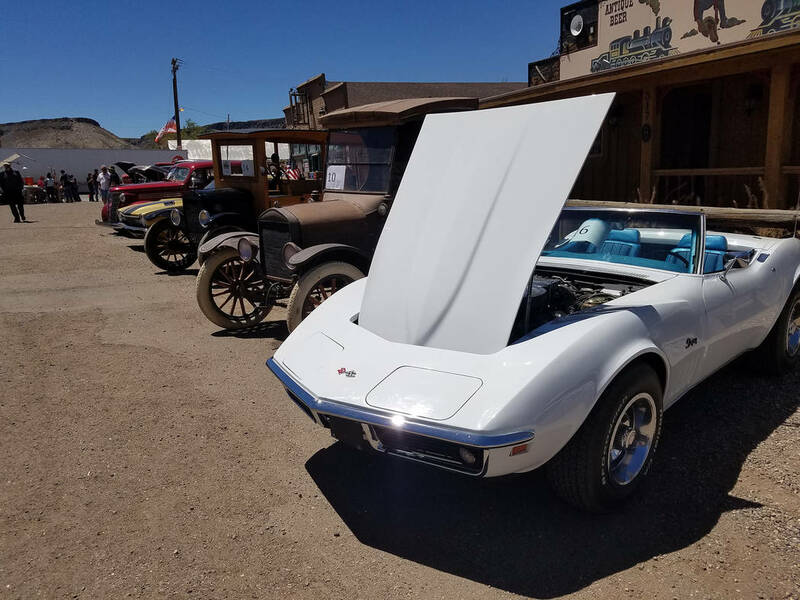 Patty Huber-Beth, president of the Goldfield Chamber of Commerce, said a classic car show will take place adjacent to the “Old Fire House Museum” at Euclid Avenue and U.S. Highway 95 (Crook Avenue). In past years, antique trucks and cars have lined up for viewing by eventgoers. Some of those have been antique Corvettes and others from the early part of the 20th century. The event is set to attract several food and other vendors. A parade will also be held on Saturday morning and is set to begin at 11 a.m.
Eventgoers should also be ready for live entertainment and other festivities during Goldfield Days 2018. 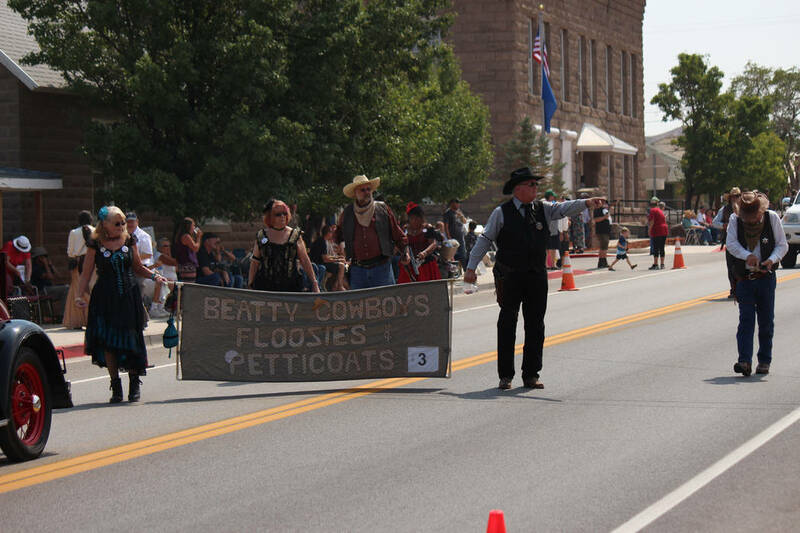 The festivities of Goldfield Days also include a land auction. The auction will contain four mining claims and nearly 20 properties available for bidding during Goldfield Days. The auction is set to begin at 1 p.m. on Saturday, behind the Esmeralda County Courthouse at 233 Crook Ave. The minimum bids on the mining claims start at $1,725 and go up from there on other claims headed to the auction block. Properties available for auction in Goldfield have minimum bids starting out at $1,500 and range up to $11,000 for minimum bids. For properties in Fish Lake Valley, minimum bids range from $7,700 all the way up to $20,000. 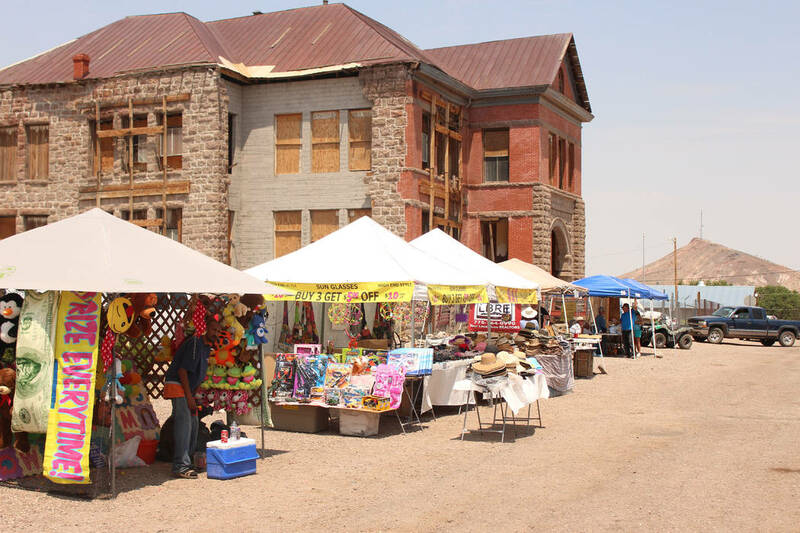 During last year’s Goldfield Days, properties sold from $1,700 up to $13,000. Red Roberts bought two pieces of property that sit beside his Goldfield Hotel, which sits at U.S. Highway 95 and Columbia Avenue. Roberts’ winning bids set him back nearly $16,000 during the 2017 land auction. Esmeralda County’s website has information posted pertaining to the upcoming event. Just head to AccessEsmeralda.com and click on the events-land auction tab. Historic building tours will also be a part of this year’s event list. That includes tours of the Goldfield Hotel. According to a post on social media, last-minute changes have been made to the Goldfield Hotel tour. The tours are set to start at the Hoist House at 300 N. Columbia, across the highway from the hotel. Attendees will also be able to purchase raffle tickets and Goldfield Hotel doors at the Hoist House, according to the social media report. Tickets to the haunted hotel tour will cost $20 per person and the hotel doors run $200. Raffle tickets are $1. Huber-Beth said the raffle tickets are available all over Goldfield. The chamber is raffling off a one-ounce gold bar as a grand prize. The Beatty Chamber of Commerce also donated a silver piece for the raffle. “We have had some great donors … Lode Star Mining and Zero1 Tours helped us to be able to offer such great prizes,” Huber-Beth said in an email. For more information on signing up or getting raffle tickets, head to the Goldfield Chamber’s website at GoldfieldNevada.org or call 775-485-3560. Potential entrants into the parade can also use that contact information on how to sign up. The annual Goldfield Days celebration is set to run Aug. 3-5 for the 2018 venue. Raffles and other entertainment is planned for the three-day venue. The event’s parade will occur on Saturday and starts at 11 a.m. The 2018 Esmeralda County land auction is set to start at 1 p.m. on Aug. 4, behind the courthouse at 233 Crook Ave.